End of Season Report “The Board” | "It's all about the Arsenal"
A fine selection of men, sadly Diamond Danny is no longer with us. Today the internet allows us to debate on Arsenal forums, blogs, social networking as well as face to face in school, work, pubs and phone like all we could do the old days. One of the debates as been about the clubs current board. How they like to keep from spending money. Talk about how they are keeping one of the richest men in the world out of the boardroom. How it looks like the old school boys club network is in operation. Why doesn’t our current owner say anything and why does he attend so few matches?? What actually do some of them do? It could also be said that maybe, just maybe we have mostly the right board in place. A board that will not throw away the clubs future by spending huge sums of money like City & Chelsea or watse it like Liveprool & Spuds that may risk the long-term future of the club. Having said that, the club obviously has money that it could spend and seemingly chooses not to do so, even when it is evident that we need players. This I believe is one of the big bug bears with supporters that when the club could get replacements in without having to spend the Earth and maybe have given us at least a better shot of getting some trophies into the cabinet for the first time at the Emirates, they did not spend the readies. Maybe it is the manager who refuses to change his ways sticking to his project. Personally (and I am no @swissrambler type geezer) if there is any profit to be made from football, it is surely in a club being successful. Right now Arsenal are being reasonably successful off the pitch as they bring in money, make a profit, from gate reciepts, selling star players, look to expand their sponsorship, commercial contracts and sign up new commercial partners. Surely the simple answer here is that if we had invested a little of money they keep locked away in the basement of the Emirates( if you used to work at the club and know the safe combination, please contact Mr. Gazidis on 0207704000 and let him have it) , we might have won more trophies in the last seven years. In football this is the best advertisement you can get. It is what brings in the fans and what makes the fans spend their money and raise the profile of the club. If you’re looking to go global in today’s football, then you need to be winning those shiny silver pots most seasons. This is surely even that simpler a task even the candidates on “The Apprentice” could get it wrong. To be fair the club signed its stadium rights and kit sponsorship at a time they needed the money to build the Emirates stadium. What they got at the time seemed like a good sum of money. Of course Liverpool, Man Utd, Chelsea and even Spurs have signed bigger kit sponsorships since as Arsenal have been tied down to theirs and will not be able to change till 2014. These kit and stadium naming right contracts are surely not like for like. If all the clubs signed new deals at the same time and one got more than the other, then you could see how the current market operates and who is in best demand. These deals are not like-for-like, the clubs mentioned are getting current market rates, so will need to wait till Arsenal’s come up for renewal to see if we have fallen behind. I believe that when our new deals come up, we’ll bet a much better deal that will put the money we get on par with what other clubs get. Let’s not forget, Chelsea (41k) Liverpool (45k) and Spurs (35k) have all to build new grounds and that is at least £400m for a state of the art stadium today. Arsenal have our new stadium in place and I would imagine that by the time any of the other clubs mentioned build a new stadium (if they ever do) Arsenal’s would be paid off. I believe on a purely business level the club is very well run, but it could be better by investing what we have in the team right now. The board should be giving money to Wenger and telling him to spend it. Make sure it’s the board that controls the purse strings and ties up contracts like DD used to do. Stop giving big contracts out to kids who as yet have proved nothing and are just potential (save a real finds like Jack). Stop having so many players on £50/60k a week and yet look to be just fringe players. There should be a table of how much a player earns. I do not think footballers are worth £100-250k a week, I think it is obscene in today, where there are financial worries all round the world. However whatever I think, there is a market value for footballers and football does seem recession proof, so the RVP’s of the world will be looking for top dollar and attract the sums mentioned and on offer. Therefore Arsenal should pay him £150/175k a week. The money should be supplemented by fringe players only earning a top rate of £30/40k a week, maybe even less. It’s time for the board to make a statement, show us the money, give RVP the contract/money his ability deserves and give him three/four more signing that will make him feel the club are going places and actually want to win things. It does not have to be £30m for each player, you can get ¾ very good team players for £10/15m each. The board really need to be doing what they should be doing, running the club and making sure Wenger does only what he should be doing, managing the team and the two should not meet. Certain people on the board, I know not what they do, should in the best interest of the club, call it a day. Today football as I mentioned is a huge multi-billion pound business. Arsenal need the likes of Kroenke and Gazidis and more younger dynamic people on the board. Is there currently a better businessman than Usmanov who seems to be making billions for fun. Chairman Peter Hill-Wood. Born in Kensington, London. His father, jolly three uncles and grandfather all played first-class cricket for Derbyshire. PHW attended Eton (where else) where he was a classmate of former Arsenal Director Sir Roger Gibbs. He served in the Coldstream Guards (maybe that’s why he is a bit wet) After leaving the Guards, PHW entered the banking industry, eventually rising to become a vice-chairman of Hambros. Hill-Wood has since retired from his post at Hambros, and is currently a director of Cavenham Ltd and Hellenic and General Trust. He married in 1971 and has three children Julian (Binky) Hill-Wood, Charles (Fim Tim Lim Bim Wim Bim Lim Bus Stop Fatang Fatang Ole Biscuit Barrel) Hill-Wood and Sarah (Mince) Hill-Wood. 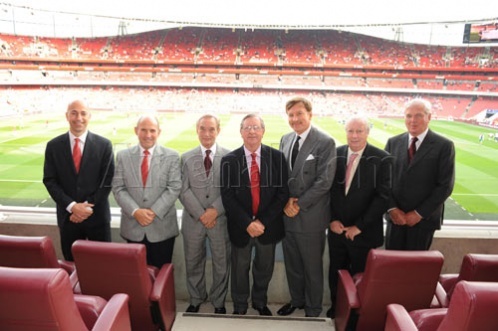 PHW is the third generation of his family to serve as Chairman of Arsenal, following his father, Denis Hill-Wood (1962–1982), and his grandfather, Samuel Hill-Wood (1929–1936 and 1946–1949). He is not in charge of any day-to-day business at the club. PHW was a colleague of (McCain) Chips Keswick at Hambros and helped recruit him to the Arsenal board to provide strong City contacts at a time when the club were financing the Emirates build. PHW sold much of his family holdings in the club to former vice-chairman David Dein in the 80’s and 90’s and the rest to Stan Kroenke. Bit of an old dodderer if I’m honest. Always shouting his mouth off Daily Star (What’s that all about?). However, he is 76 bless him… Many a Gooner feel it’s time for PHW to move on and let a younger generation take the club forward. He is football’s answer to Prince Phillip with his quotes and basically making a fool of himself. Chief Executive Ivan Gazidis (48) is currently the chief executive at the club. Gazidis moved to Manchester at the age of 4. He attended Manchester Grammar School, where he excelled as a football player. Being an adopted Mancunian from a young age, he supported Manchester City. Later he attended St Edmund Hall at the University of Oxford, where he was twice awarded a blue playing football against Cambridge in 1984 and 1985. He graduated with a degree in law in 1986 and in 1992 then moved to the United States to work for Latham & Watkins. In 1994 he joined the founding management team of MLS. He oversaw MLS’s key strategic and business decisions and its marketing arm, Soccer United Marketing, of which he was president.He also helped promote the Mexican Football Federation and the CONCACAF Gold Cup. In November 2008 Gazidis accepted the post of chief executive at the club. He succeeded former managing director Keith Edelman and took over many of the roles formerly undertaken by ex-vice-chairman David Dein. Director Kenneth John Friar He is currently the club’s acting managing director. Ken was born in Islington (pwoper Gooner Country) in 1934 and went to Highbury School. He began working at Arsenal part-time as a 12-year-old. A bronze bust of him was unveiled at the club’s AGM in October 2011 to mark his 60 years with the club. Ken rose through the club ranks to become Company Secretary replacing Bob Wall in 1973. In 1983, he was appointed Managing Director, a role he lasted in until 2000. During this time, Ken had taken an active role in negotiating manager and player contracts as well as fostering club links with the community and supporter groups. He stepped down from this role to concentrate on the club’s move to the Emirates Stadium, but remains a board member. On May 1, 2008 it was announced that he had become acting Managing Director on the resignation of Keith Edelman. He was awarded his OBE in 2000 for services to Association Football. The London Borough of Islington awarded him the freedom of the borough in 2004. The North Bridge, which joins Arsenal’s Emirates Stadium to Drayton Park, was renamed ‘The Ken Friar Bridge” in tribute to him. Director Sir John Chippendale “McCain Chips” Lindley Keswick. Sir Chips attended Eton College and the University of Aix-Marseilles. He married Lady Sarah Ramsay, daughter of the 16th Earl of Dalhousie, in 1966. They have three sons David, Tobias and Adam. Sir Chips was formerly a director of Hambros Bank and colleague of Peter Hill-Wood He is also non-serving director of Arsenal Holdings plc, the parent company of Arsenal. He is a member of gentleman’s clubs White’s and The City University Club. Director Lord Harris is the chairman of Carpetright plc (His wife walks all over him) and has over 40 years’ experience in carpet retailing. Lord Harris was appointed to the board of Arsenal Football Club as a non-executive director in November 2005. He was made a Life peer as Baron (Delboy) Harris of Peckham, in the London Borough of Southwark in 1996. Lord Harris is ranked 206th in the Sunday Times Rich List with an estimated wealth of £285m. Director Enos Stanley “Stan” Kroenke (65 and born in Columbia, Missouri) An American business entrepreneur. His wife, Ann Walton Kroenke, is the daughter of Wal-Mart cofounder Bud Walton. He is also the majority shareholder of the club. He currently lives in Columbia, Missouri. Kroenke was estimated to be worth $ 3.2 billion by Forbes in 2011. In 2010, Kroenke exercised his right of first refusal to buy the remaining interest in the St. Louis Rams. In August 2010, he became full owner of the Rams by unanimous consent of the NFL. To gain approval from NFL owners, Kroenke agreed to turn over control of the Denver Nuggets and Colorado Avalanche to his son, Josh (you’re kidding) Kroenke, by the end of 2010, and he must give up his majority stake in both teams by December 2014. The NFL does not allow its owners to hold majority control of major league teams in other NFL markets. Kroenke is a somewhat reclusive man who stays out of the limelight. He is popularly known as “Silent Stan” because he almost never gives interviews to the press. Would you with that syrup and tash? He rarely interferes in his teams’ day-to-day operations. Arsenal already had a technical link-up with Kroenke’s Colorado Rapids when in April 2007 Granada Ventures, a subsidiary of ITV plc, had sold their 9.9% stake in Arsenal Holdings plc to Kroenke’s KSE UK inc. Kroenke went on to buy further shares in the club, taking his total stake up to 12.19%. The club’s board initially expressed skepticism “”we don’t want his sort here!!! who said that?) that a bid would be in its best interests,but gradually warmed to him as part of counteracting Alisher Usmanov’s rival bid for the club. By June 2008 the board was prepared to let Kroenke take over the club, and in September 2008 it was officially announced that Kroenke had joined the Arsenal board of directors. In April 2011, it was reported that Kroenke was in advanced talks to complete the takeover of Arsenal. The following day, it was announced that he increased his shareholdings in Arsenal to 62.89% by purchasing the stakes of Danny Fiszman and Lady Nina Bracewell-Smith, and agreed to make an offer for the rest of the club at £11,750 per share, valuing the club at £731M. Bubbling Under Alisher Burkhanovich Usmanov born 9 September 1953 in Chust, Uzbekistan. According to the 2011 edition of Forbes magazine, Usmanov is one of the world’s richest men, with a fortune estimated at US$18.1 billion (maybe a lot more today with facebook shares). He accrued his wealth from mining, lumber and investment. Usmanov married Irina Viner, a top rhythmic gymnastics coach, in 1992. In August 2007 he acquired a 14.58% stake in the club. He and his business partner Farhad Moshiri bought shares owned by David Dein for £75 million (I see you can make money out of a football club, along with Danny and LNBS) . Red and White Holdings became the largest shareholder in the club outside of members of the board of directors. In September 2007 it was announced that Red & White Holdings had increased its shareholdings to 23%, making it the second largest shareholder in the club behind at the time Danny Fiszman. In February 2008 he has increased it further to over 24 per cent, just short of Danny Fiszman’s 24.11 per cent. There was speculation that Usmanov could already be the club’s main shareholder at 24.2% which he later increased to 25% in February 2009. If R&W’s stake were to reach 30%,they would have to launch a formal takeover. Usmanov said he had been an Arsenal fan for seven years and he had a great love for Arsenal. Usmanov’s interest precipitated a ‘lock-down’ agreement by the Gunners’ board, whereby Chairman Peter Hill-Wood announced that club directors could sell their stakes only to ‘permitted persons’ before April 2009 and had to give fellow board members ‘first option’ on shares until October 2012. However, there was a termination clause in the agreement in October 2010.,“The lockdown…makes us bullet-proof,” said the then Arsenal managing director Keith Edelman. In April 2011 American businessman Stan Kroenke already a major Arsenal shareholder, increased his stake in the club to just over 62% after buying out Fiszman and Lady Nina Bracewell-Smith, making him the majority shareholder. As Kroenke’s stake had risen above 30%, he was obliged to make an offer to buy out the remainder of Arsenal shares. Usmanov refused to sell, however, and maintained his stake, claiming a “love” for Arsenal, despite the fact that his bid for outright ownership of the club is seemingly over. In June 2011, Alisher Usmanov increased his Arsenal FC share beyond 29%. His company, Red and White holding announced on 20 June 2011 that it had more than 29% stake in Arsenal holdings plc.This was further increased after Usmanov purchased shares held by Scottish football club, Rangers in February 2012. Mr. Usmanov own two executive boxes at the Emirates that he has had knocked into one, makes sense when you see the size of him. He owns the Sutton Place estate, near Guildford, UK, a Tudor mansion in extensive grounds, once owned by J. Paul Getty. In July 2008 it was revealed that Usmanov was the owner of Project Opal, a 110 metres (360 ft) yacht. In addition to the yacht, Usmanov owns an Airbus A340-300 airplane with the registration M-IABU. The plane is named Bourkhan after his Dad’s .